Romantic Ideas For Busy Couple! 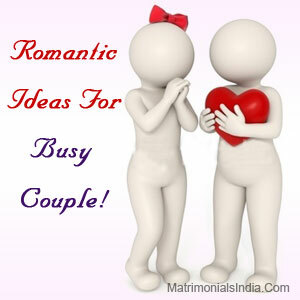 » Romantic Ideas For Busy Couple! Working couples or those who are career oriented find that, after a few years of their marriage, the initial excitement of togetherness just vanishes. Work keeps them busy all the time. They come home, eat dinner and fall asleep, only to be woken by the alarm the next day. Those rosy and peachy feelings that a couple loved to exchange get chucked as the mad rush to make a place in the rat race of this fickle world begins. Stay In Touch : Calling at least once or twice, if possible, in a day is not a choice but something that should be done religiously. It would be wrong to call it as interference or being over possessive! It is a way to show your concern for your partner, though it is equally important to respectful each other's personal space at the same time. Start Dating Once Again : Why don't the two of you schedule a day just and just for yourself? Send your children to their aunt and uncle's place and spend some quality time together, dating just like the old times! Work Together : Simple things like making dinner, cleaning wardrobe, folding up laundry, clearing clutter in the house, are among the various things a couple can do together . Working on the same idea, spend some alone time with each other. While your hands are busy, you could talk about important issues that you are facing or ever wanted to discuss. All you need to do is, to take it easy, slow down, and put a break to your fast paced lifestyle. Take some time out of your busy schedule, tickle your romantic bones and get back to those rosy days to add new pages to your beautiful love story!